Leave a message for DONNELLY family members. Donnelly My interest is trying to find any further information on my grand father, William Donnelly DOB 02.07.1906 Dunshaughlin, County Meath.DOD 05.11.1982 Blanchardstown; Dublin. His mother’s name was Alice Donnelly, as it seems my gand father illegitimate since his mother’s maiden name was Donnelly. (Part 1 of 3) The Donnelly name has a long history in Ireland and now DNA can trace its origin to the north-western region of the Emerald Island. The Donnelly story [dominated by DNA tribal marker R1b-L513, Subgroup B1] can trace their beginnings to the Finn Valley in Donegal, Ireland from 50 BCE. Perhaps the journey begins with the Clanna Dedad; Deda, son of Sen or Deda Mac Sin. The Donnelly surname origin is from Clan Domnaill [DNA Tribe R1b-L513, Subgroup B1] and relations who remain in Ireland take the modern surname O’Donnelly, McDonald, O’Donoghue and Hughs in Ireland. (Part 1 of 3) The Donnelly name has a long history in Ireland and now DNA and some recorded history to the north-western area of the Emerald Island. The Donnelly story [dominated by DNA tribal marker R1b-L513, Subgroup B1] can trace their origins to the Finn Valley in Donegal, Ireland from 50 BCE. Perhaps the journey begins with the Clanna Dedad; Deda, son of Sen or Deda Mac Sin. 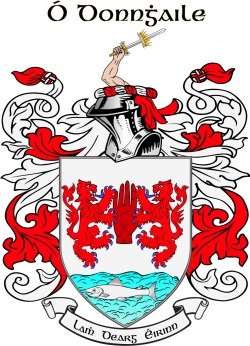 The Donnelly surname origin is from Clan Domnaill [DNA Tribe R1b-L513, Subgroup B1] and relations who remain in Ireland take the modern surname O’Donnelly, McDonald, O’Donoghue and Hughs in Ireland. (Part 2 of 3) According to research, the Domnaill name is also found in Brittany, France. It is a very old name which appears in the 5th century Roman inscriptions as Dumnovellaunos in Brittany meaning “Deep Valour” equivalent to Irish Domhnaill. But how could this be? Recent discoveries from DNA testing are unlocking the migration patterns of Celtic tribes as late as 800 CE to 1200 CE. The Donnelly story begins in pre-history Ireland but relatives will then move to Wales where the family can be traced back to their Welsh tribe Cydifor Fawr. A descendant and many of his kin will then move to Brittany, France during the Dark Ages. Invite more DONNELLY family members! Click 'Invite' to connect with more members of the DONNELLY tribe.